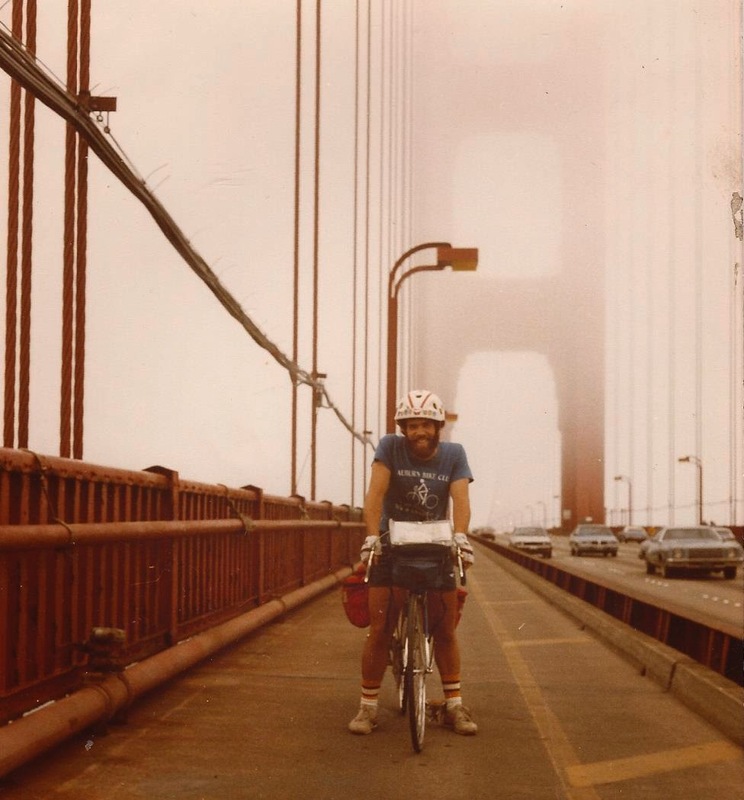 Here's a great story about bicycling and charity out of South Dakota. Last year it distributed about 500 bikes, but earlier this year the charity was down to 5 or 6 bikes, and it looked like it might have to close the program. 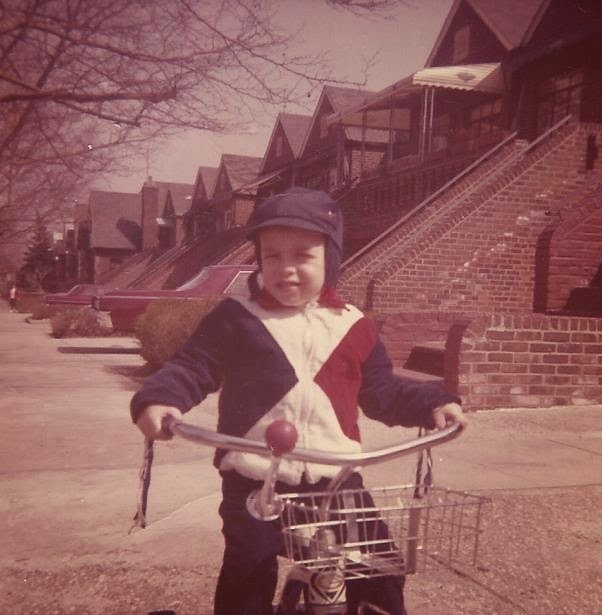 Then the owner of a bicycle store called the Two Wheeler Dealer, inspired by the Cash for Clunkers program, started offering people $50 store credits to bring in their old bikes. In two months he got about 100 bikes. He and his employees fixed them up, and he donated a lot of them to the charity's Bikes for Work program. Tonight's Critical Mass Ride was excellent. We had about 20 cyclists, including about 10 from the Seminole Heights Bicycle Club. I strongly suggest you join the monthly ride, which is held the final Friday of every month. We meet at 6:30 PM at Lowry Park, across from the zoo on North Boulevard near the Sligh Ave. corner. We bike slowly for the estimated 14 miles or so and it's cool to bike as a group and take a lane. People enjoy seeing us ride, such as this part through Ybor City. Here's the fee sign at Flatwoods. $2 for a car per visit but go by bike and you can get in for free. There's also a $50 annual pass. It's Critical Mass Time! This month's bike ride is tonight. Gather at 6:30PM at the Lowry Park on North Blvd., off Sligh Avenue. We take off at 7 PM. Bring lights. Recycling cycling -- this collection site is at SWFBUD store Bicycle Outfitters in Seminole. I know it's weird -- it's late October and it's supposed to be cooling down. But even though the acorns are flying, it still feels like summer, all muggy and all. But don't fret. Some terrific bicycle events are around the corner in November. Close to home here in Seminole Heights, there's a Seminole Heights Bicycle Club tripleheader on Nov. 7. 8:30 AM: "Tour de Brisket," easy 5 1/2-mile neighborhood ride. Meet at 1203 E. Powhatan Ave.
11AM-3PM: SHBC expo at the Old Seminole Heights Fall Festival at Ola and Henry Park. 6PM: Bike-in Movie Night and Pot-luck dinner at 1203 E. Powhatan Ave. (That's where Doug Jesseph's brisket comes in): Movie is the "Amateur." Cycling routes: 100K Century Loop starts 7 a.m.; 25 Mile Challenge, 8 a.m.; 5 Mile Family Fun Ride, 9 a.m.; Health & Wellness Expo, 10 a.m.
Nov. 6-8 is SWAMP's Alafia Fat Tire Festival. Fri-Sun event registration is $85 per person, $70 for SWAMP members. Saturday only registration is $60 and does not include event SWAG or camping. Sunday only registration is $20 and does not include event SWAG or camping. It's a one-day, multiple distance cycling event. The Ride will help raise funds and awareness for UCP/Achieve Tampa Bay, to help provide equal opportunities and access for children and adults with disabilities. Cyclists will have the option of riding 35, 65 or up to 112 miles during this amazing ride. The Ride will start at J.B. Starkey Park with the 35 mile route continuing mainly on trails and the 65 and 112 mile routes using the back roads of Pasco and Hernando counties to maximize scenery and minimize traffic. Each rider agrees to raise a minimum of $150 in donations in order to ride. You may also register to participate in the Ride as a volunteer for the event. John Sinibaldi tells me there are some terrific cyclo-cross clinics led by Jeb Stewart coming up. Where: Julian B. Lane Riverfront Park. 1001 N. Blvd., 33607. What: Improve your ‘cross skills w/ instruction from USAC elite coach Jeb Stewart, including; mounts, dismounts, starts, cornering, running barriers, run-ups and off camber riding. Practice your skills each week on a real ‘cross course! Today was a bike trip in Lake County, west of Orlando and home to some of the best bicycling in Florida. Leading off the photos was the photo above that showed the area's commitment to bicycling -- specifically the law that requires drivers to pass a bicyclist by a minimum of three feet. In the Tavares area, the lovely Dora Canal is the finest one mile of watery navigation, connecting lakes in Lake County in the Tavares-Mt. Dora area. Not only do cars think they own the road but they also think they own the river. There's always a little gem of ingenuity at good ol' Fun-Lan market in the bicycle department. Like this morning and this beauty of a seat made from electrical tape, with a cut-out fender. Hey, it gets him where he wants to go. You wouldn't know it from the dearth of bike lanes in Tampa, but Tampa has a growing bicycle scene with no less than THREE bicycle events happening tonight. The bad news was that I could attend only one. The St. Pete Times Forum hosted an environmentally-friendly "Green Night" at tonight's Lightning-San Jose Sharks and invited bicyclists to pedal to the game and get in for free. Then there was a movie about a mountain-bike race in the high-mountain area of Leadville in Colorado showing at Citrus Park. The movie, Race Across The Sky, included Lance Armstrong. I normally would have attended at least one, if not both, of these events. But I was off to Carrollwood Bicycle Emporium -- a founding SWFBUD member store -- for its annual customer appreciation night to man a SWFBUD table at the gathering. Here's CBE owner Brian Eckman, a terrific bicycle advocate who sits on the Hillsborough Bicycle-Pedestrian Advisory Committee. In attendance tonight was Tina Russo, chair of the BPAC and CBE customer and friends from the Seminole Heights Bicycle Club. Manny drew a crowd of bicyclists interested in getting tips on fixing flats. There's Ellen of the internationally-reknown and Tampa-based American Classic wheel manufacturing company enjoying a hearty chuckle with CBE's Brian G. on the right and friend. Doug and Doreen from Seminole Heights enjoy the night. 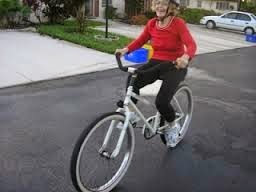 Doreen bought her first road bike tonight. I'm happy and proud to announce that we have a new member of SWFBUD. Street Fit 360, a retail bicycle dealer on Gandy Blvd. in Tampa, has joined SWFBUD. SWFBUD now has 11 members, including nine retail bicycle stores. I met Jana and Andy Clark, owners of Street Fit 360, after I represented SWFBUD at public meetings this summer regarding the fate of the Friendship TrailBridge. They are true bicycle advocates and Jana and Andy support SWFBUD's efforts to make the Tampa Bay area a more bicycle-friendly market. They look forward to working on bicycle issues to grow bicycling in this area. Tampa Government Believes Bicycle Safety Features Such as Bike Lanes Are "Non-Essential"
Here's why the city of Tampa government did not stripe bike lanes on Cass and Tyler streets in downtown Tampa -- even though Cass and Tyler are on the city's master plan for bike lanes -- as part of the recent UCAP utility road project. Notice how the city of Tampa government believes safety facilities such as bike lanes are "non-essential." (Reason 3 below). 1) The pipeline alignment in the roadways moved between the south to the north side of the street, meaning that the restoration would also change lanes. As a result, there would not be an area of consistent restoration to tie in the bike lanes. 2) Timing for the respective projects was not conducive to linking the projects together. 3) Economic conditions make it very challenging for the City to undertake any "non-essential" projects at this time. The City, the TDP and the UCAP team remain committed to work together on projects such as this and will continue to look for opportunities to do so in the future. Please let me know if you have any additional questions. Yikes, the state of Florida plummets to number 32 in the country for being bicycle friendly after being number 20 last year. SWFBUD member Christopher Burns posted the League of American Bicyclists rankings on Facebook. Here's the grim data for Florida, which fell 12 spots in one year. I wonder if Florida's highest-bicyclist-fatality-rate-in-the-country might have something o do with this. My fellow Seminole Heights cycling pal Jack Sweeney sends this hilarious Japanese bike messenger video which includes a special bike messenger how-to-poop advice. 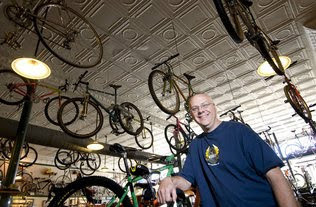 My pal Willie Drye, Bicycle Stories' official North Carolina correspondent, sends this gem of a bicycle story about a guy who has a downtown bicycle store in Statesville, NC that is also a national museum dedicated to mountain bikes. Flatwoods is a sanctuary, and it's my place close-to-home when I need to get away. 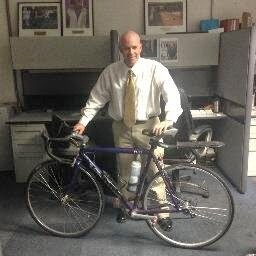 Another bicyclist killed in Florida -- this time in St. Petersburg. Amscot Financial, a leading provider of convenient, consumer-oriented financial services, will donate and distribute 4,160 free bike helmets on Oct. 22 in 12 Florida counties where the company operates branch locations. Remember a few months ago I attended packed Friendship TrailBridge meetings filled with folks from both sides of the Bay who wanted the Hillsborough and Pinellas county commissions to work together and fix the closed pedestrian/bicycle bridge and get it re-opened. Well today, I represented SWFBUD and attended the most recent Friendship TrailBridge meeting. The meeting mood was quiet and there was a small crowd, maybe a dozen or so residents still fighting to get the closed TrailBridge back open. A TrailBridge two-county committee made up of county commissioners from both Pinellas and Hillsborough, plus a couple of residents, was reviewing what could be done to re-open the TrailBridge. It would cost $15 million to fix the 2.6-mile bridge, which has shown metal deterioration. I don't get the sense the county commissioners on the TrailBridge committee were too compelled by today's discussion. Pinellas County Commissioner Calvin Harris, a nice enough guy, was checking out his text machine and sending a message during discussion. Meanwhile Ben Kelly, an aide to Hillsborough County Commissioner Jim Norman who sits on the committee, is so fascinated by the TrailBridge committee's discussion that he's working the keys on his Blackberry. Have you noticed more bicyclists are towing trailers? Like this guy in downtown Tampa today. When I bike, I get a pretty upclose view of signs of life. Like the old dog poop business I saw on Bay-to-Bay this afternoon. Let's take a closer look. Yup, it's dog poop. 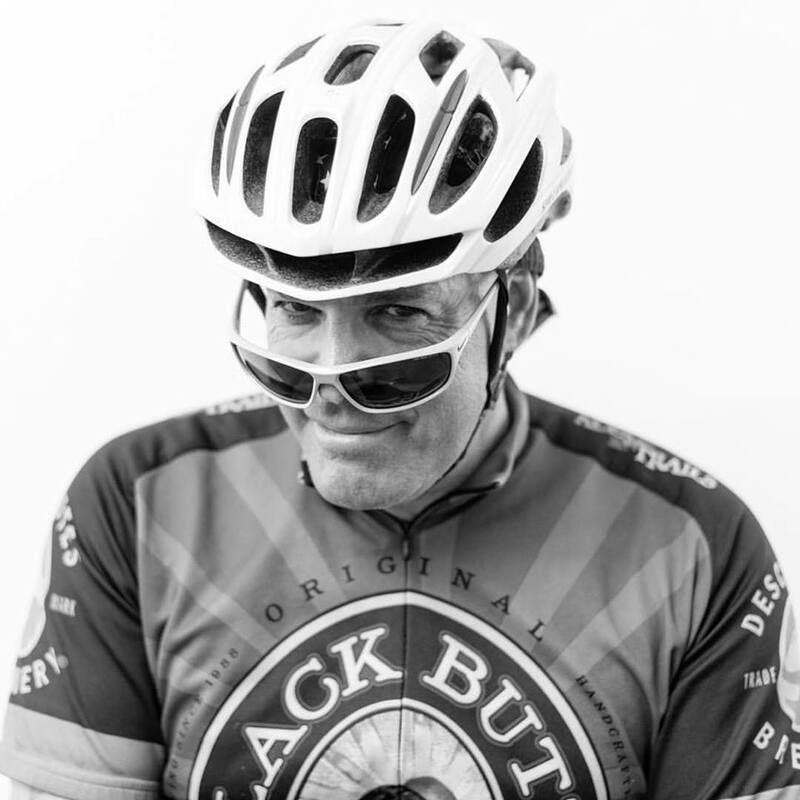 "I know many cyclists out there already avoid Wal-mart for the terrible things they are doing to the world and our neighborhoods, but times are tough and sometimes you find yourself trapped into having to go to their vision center because you don't have vision insurance. "I rode to my appointment this morning as I do not have a car and commute 250+ miles a week by bicycle. Upon arriving I noticed they didn't have any bike racks or anywhere to lock up a bike so I proceeded by visiting the garden center to ask if I could leave my bike by some empty shelves in the corner. "Of course the answer was 'no, and it has to go outside of the gates,' with no further explanation. "I thought why not try Customer Service? Upon arriving to the counter I asked if I could place my bicycle out of the way by the edge of the counter during my eye exam. "I received a 'no, it's against policy.' I explained that there was no where else to lock up a bike. Their response was to lock it a pole outside. All you had to do was lift the bike over the poll to steal it. "I explained I wasn't comfortable with that as I have no other forms of transportation, I quickly received another 'no.' I asked to speak with a manager as for an opportunity to give me a solution in which she had none and told me I had to leave and could not keep my bike in the store for 'liability purposes' from a store that sells bicycles and lets kids roll around with Heelys. "No one offered any solutions, no one offered to help, they had no options for cyclists and told me to lock it up at Best Buy. Apparently you need a car or ride the bus to shop at Wal-mart #1960 on Dale Mabry and I-275? "I am really disappointed to be treated so poorly and was wondering if anyone else had any similar experiences." Good morning from the 22nd Street Park, the nicest unknown park in Tampa. Crisp, cool and chilly enough for me to don thin cotton gloves. Remember these guys? The three Tampa police officers on bicycles who joined the Seminole Heights Bicycle Club for the easy ride on Oct. 3. I bumped into the trio while trekking back along the early morning saunter. Friends visiting from up north? Family in town for a visit? Want to show them a piece of unspoiled Florida? You know, maybe a slice of land untarnished by the nasty Florida sprawl cocktail of unyielding pavement, ugly architecture and cars everywhere. It's an old-time Florida state park, complete with nature trails cutting through pines and oaks, a gorgeous wooden canopy bridge and tower that offers superb vistas of the surrounding terrain, an open grassy savannah that looks like the plains of Africa and watery access that just might give you a peak at a gator. It's easy to get there. Take I-75 south to the Sarasota area and get off at the State Road 72 exit and head east for about 10 miles or so. The park entrance will be on your left. I cycled down there this afternoon and the cool weather was superb. It was fun to wear my first long-sleeve shirt of the fall bicycle-riding season. A tree by the canopy bridge offers a vegetative home for another plant. On the road cycling to the Withlacoochee Trail, between Dade City and Zephyrhills. Who said Florida doesn't have mountains? Slate wrote a terrific piece on the age-old issue of bicyclists and the challenge of complying with road laws that are designed for cars, not bicyclists. Sent to Bicycle Stories by North Carolina correspondent Willie Drye. A bicyclist slowing down, looking both ways and rolling through a stop sign when there's not a soul in sight doesn't get me excited. But the bicyclists around Tampa Bay who bike against traffic and don't wear a light at night need to be stopped and given a warning by police for their own safety. RIDGE MANOR -- I couldn't wait to start cycling this morning. Strapped on the front blinking white light. Made sure the red strobe light was blinking on the back. And began pedaling the Trek 2200 road bike a little after 7 am. After six months of perspiration in the morning, my arm hairs tingled thanks to 60-degree temps and a cooling dry wind from the northwest. It was off to the Withlacoochee Trail at State Road 50 via Flatwoods park -- a 64-mile journey through Zephyrhills and Dade City. Ridge Manor here I come. Early morning clouds disappeared and a clear sky emerged as I bucked a steady headwind from the north. It didn't matter at all, those winds in the face. Fall and its dry, cool weather are here. It's hard to not be envious of my cycling pal Ellen who is enjoying autumn weather on the off-road trails in the Boone, NC area. But at least here in the Tampa Bay area the weather has dropped into the 70s from the low 90s this week. That means a long road ride this morning. Despite all the rain and wind and threat of more storms, the Florida Orchestra's Pops in the Park concert at River Tower Park in Sulphur Springs went on this evening. And the setting was quite lovely. One attendee arrived by trike, with an engine on the rig. People ask me all the time, "What can I do to help" the bicyclist cause in Tampa? As you know, Tampa has one of the worst reputations in the country for being unfriendly to bicyclists and pedestrians. Well, first you have to let the city of Tampa government hear your voice. The city has a nice Web site to log on to for the purpose of documenting problems. It's the customer service center form and you can get it here. Feel free to send in yours. "The city's master plan for trails indicates bike lanes on Cass and Tyler streets in downtown Tampa. "There is a utility project to install new utility lines on Cass and Tyler, yet I have learned the city will not stripe bike lanes on Cass and Tyler when those roads are repaved. "Why is the city not complying with its own trails master plan and failing to put in bike lanes on Cass and Tyler when you repave those roads? "As you know, independent reports cite Tampa as one of the most bicycle-unfriendly cities in the country and installing bike lanes on streets that are specifically designated for bike lanes under master plans would help Tampa shake this most negative reputation. Nico Stearley, an architect at HOK architects in Tampa, participated in the 2009 Bicycle Bash by the Bay, Presented by Cure on Wheels, and did a nice blog post for HOK. You can read Nico's post here. 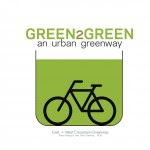 Nico and her comrade at HOK, Anna Vasquez, are both bicycle commuters who have drafted an urban greenway proposal that would run underneath the current Selmon Crosstown Highway and serve as a trail in the shadow of the expressway. Bike rides take all forms, such as tonight's with Bridget when we trolled the local Seminole Heights streets along the interstate's fences to see unusual homes tucked amid pavement and trees. We first stopped at Lake Roberta to catch a glimpse at the western sky. The Tampa City Council voted today to postpone a decision on a billboard compromise deal with two mega billboard companies until Feb. 5. Here's the St. Pete Times story on the council action. Pictured is City Attorney Chip Fletcher, who tried to explain that he'll chat more with residents and city staffers about the proposed legal compromise regarding billboards in the city. Bicycle Bash T-shirts are still available. $10 each. Buy 2 and get 1 free. Contact SWFBUD director Alan Snel at alansnel@yahoo.com to get your T-shirt. 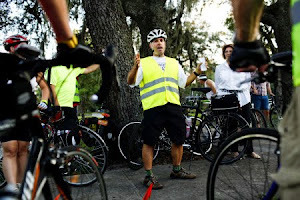 The Seminole Heights Bicycle Club will lead a bike ride to River Tower Park off Florida Avenue in Sulphur Springs on Friday for a free Florida Orchestra performance. Meet at 6 PM at the Garden Center on Central Avenue and we will leave promptly at 6:15PM. Concert begins at 7 PM. Jose the Green Vest Rider will be leading this 2-mile bike ride. A helmet, a front white light and rear red light are required. Feel free to bring a blanket or other supplies for the concert. And people are welcome to meet us there, too. In New York, bicyclists being killed by negligent car drivers has prompted the Bike League to have a legal symposium on improving the vehicular homicide prosecution of drivers who kill bicyclists. As usual, my Seminole Heights bicycle comrade in pedals -- Jack "Ghost Rider" Sweeney put together another command performance of photographs from Sunday's Bicycle Bash by the Bay for his bikecommuters.com Web site. Ken Sturrock, my friend in the Seminole Heights Bicycle Club and a member of the Hillsborough County bicycle-pedestrian advisory committee, took some terrific big-picture environmental shots of Sunday's Bicycle Bash by the Bay.